The exam MAT was conducted on June 25, 2016, by the institution at various centers across the state of HP. Himachal Pradesh University (HPU) releases notification every year and invites online applications for the Management Aptitude Test. A huge number of eligible and interested candidates applied and appeared for the examination. Candidates who had written the exam can check the results on the official website which is expected to come on 7th July 2016. The university is situated at Summer Hill about 5 km from the world-renowned hill station Shimla, in the vicinity of the Indian Institute of Advanced Study. It is wholly financed by the Government of Himachal Pradesh and the University Grants Commission, New Delhi. As per the rules and regulations of the University, the candidates should know that the score of HPU MAT will be taken into consideration for shortlisting the candidates, who will be further called for the Group Discussion or the Interview round. The institution offers a large number of undergraduate and graduate programs for the candidates. HP University is a public non-profit university. The HPU was founded on July 22, 1970. It is the only multi-faculty and affiliating University in the state. HPUBS has already released the list of all the HPUMAT Exam centers across the state of Himachal Pradesh. HPU Management Aptitude Test HPUMAT 2016 is conducted by the Himachal Pradesh University Business School (HPUBS) to offer admission to the candidates in the MBA programs of different universities of the HP and institutes affiliated to these universities. Some of its centers are situated in Solan, Shimla, Hamirpur, Dharamshala, Una, Mandi, Chandigarh and Palampur. • Visit the official website i.e. hpubsshimla.org. 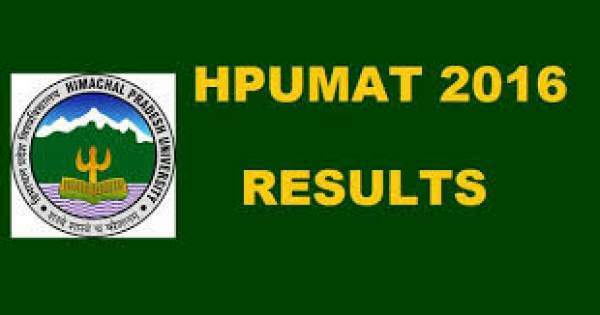 • Click on the link ‘HPUMAT Results 2016’. • The result will appear on the screen. • Download or take a printout for future purposes. Stay tuned to The Reporter Times for latest education news exam results and all other government jobs updates. Don’t forget to share it on social media sites like facebook, twitter, google plus, etc. so that your friends and other aspirants can also know about it.